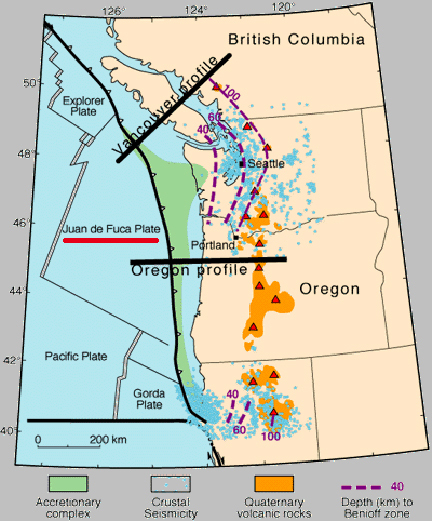 The 90,000 square mile Juan de Fuca Plate is sliding under the bigger North American Plate a few millimeters a year. Where the two plates meet is called the Cascadia Subduction Zone (black line with spikes) that extends from Vancouver south down the coast of Washington, Oregon and northern California. Seismic estimates are that every 250 to 500 years, the plates "unstick" or break their overlap in earthquakes that can range between magnitude 8 and 9. The last big one was 1700. Map by USGS.